I very rarely eat donuts these days. 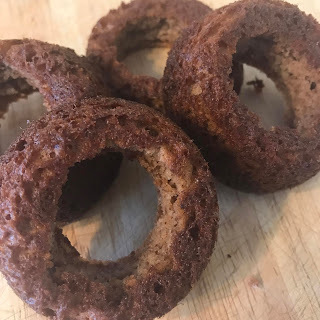 That is why I kind of geeked out when I saw Pruvit share a keto donut recipe on their blog in honor of national donut day! Any opportunity to make a special treat into a blog post, I jump on. Not only were these keto donuts really easy to make, but they were really tasty as well! They definitely hit the spot, and stayed within my nutrition standards! Preheat the oven to 350 degrees and grease your donut pan. In a large bowl, stir together the almond flour, KETO KREME, erythritol, baking powder, cinnamon, and sea salt. In a separate small bowl, whisk together the melted butter, almond milk, eggs, and vanilla extract. Stir wet mixture into the dry mixture to combine. Fill donut pan 3/4 of the way with batter. Cool until donuts are easy to remove from the pan. You can also add some coatings to your donuts if you'd like, but I chose to eat my plain! Enjoy! !